A week ago today, our group arrived in Marseille, France and then made our way to a lovely hotel in the countryside near Arles. What a treat that there were horses in a field nearby so we took our cameras to practice. This herd was very well-groomed (some had even had bells on) except for one stallion who still had his long mane. We saw many birds, the quirkiest being the hoopoe but none us ever managed to get a good photo as they were too quick to fly away when approached. In the evening, we had a wonderful meal and of course, wonderful wine! Vive la France! 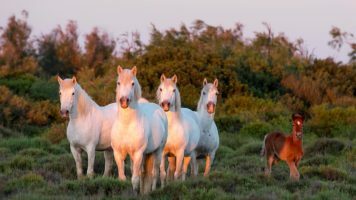 Stay tuned for Day 2 where we meet a herd of semi-wild horses in the Camargue marshes and hunt for flamingoes!